You know how recipe writers are always asking you to use "fresh homemade breadcrumbs" and you're always rolling your eyes and huffing "yah right, like I'm going to buy a loaf for that..."? 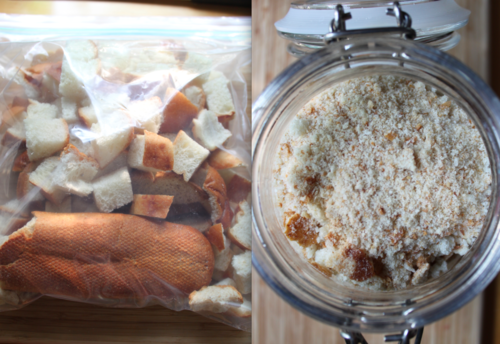 Here's my solution: I keep a gallon size zip-top bag in the freezer and every time I have a leftover piece of baguette or that weird little end thingy from a sliced loaf, I chuck it in there. When the bag gets full, I thaw it, throw the bread in the food processor and then dry in a 300˚F oven (takes about 10 minutes for most batches). Store in an airtight container in the pantry - and quit rolling your eyes 'cause they might stick back there. Just saying.